For rugged, portable weighing, Rice Lake’s Deckhand is the perfect choice. Large rubber wheels and diamond-tread top plate simplify industrial weighing jobs and make movement from place to place a one-person job. A steel handle doubles as the indicator base for a variety of Rice Lake weight displays. Optional ramp available. Select the Deckhand stand-alone model, or the all-in-one, factory-calibrated Deckhand Rough-N-Ready system with 482 Plus indicator. 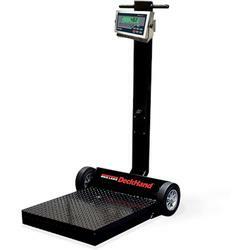 Move the DeckHand to any part of a facility and be instantly ready to weigh accurately. The platform is designed to weigh perfectly on all corners. 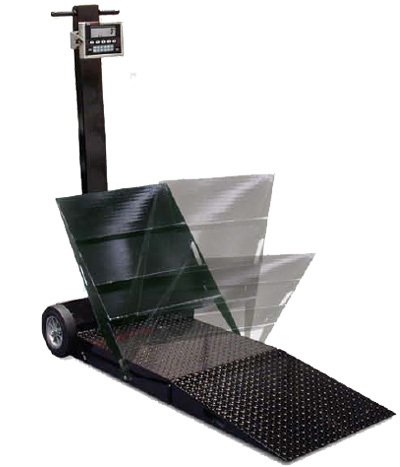 Off-center product loading will not affect weighing accuracy. Partner this scale with one of Rice Lake’s battery-operated indicators. Installed with the IQ plus® IQ plus® 590-DC for a clear view of the weight no matter where the scale is located. Shown with an optional ramp, allowing barrels and other large objects to be easily moved on and off the scale. 2 opto-isolated, 5 to 24 VDC, active high inputs. 2 inputs (requires relay output option). Primary keys, pseudo functions, batching functions. (Optional) Ethernet and USB Board: USB 5-pin header for PC, printer or flash drive. Ethernet TCP/IP, RJ45 jack, server and client ports.